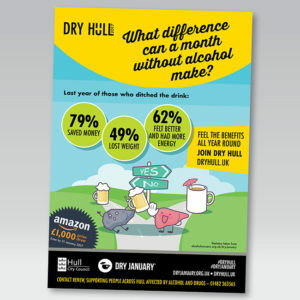 Dry January is Alcohol Concern’s flagship campaign and last year convinced a humongous 5 million people to take part in giving up booze in the interests of their health and their post-Christmas depleted bank accounts. According to the Office of National Statistics, 56.9% of Opinions and Lifestyle Survey (2016) respondents aged 16 years and over drink alcohol, which equates to 29 million people across the entire population. Binge drinking among young people (aged 16 to 24 years) is particularly concerning, as, whilst their consumption of alcohol overall is lower than any other age group, when they do drink, the amount they drink on their heaviest drinking day tends to be higher than other ages. This is an issue that affects all City and County Councils across the UK in terms of the health and well-being of their residents and anti-social behaviour caused by excessive drinking. Be social – Social media played a significant role in sustaining momentum through daily micro-blogs, motivational Tweets and Facebook posts. We have previously used a daily countdown calendar that kept people in the loop and on the wagon, using incentives and useful tips. If you haven’t already, now is the time to get the Dry January wagon moving, prepare all your social media assets, adverts and your events to really help highlight the benefits (health and financial) of taking part in the campaign – and raising some money for charity too. A great way to spend your January! If you want to be merry this Christmas, knowing that your Dry January campaign is complete and ready to go, contact the team at Yes Agency. Call us on 01889 564931, send us a Tweet @yesagencyuk or email us at ask@yesagency.co.uk and we’ll take the edge off your pre-Christmas stress.